Tweets of the week: Charlotte Flair’s feathered friends, Alexa Bliss’ porky pal, more! Danny Garcia: When I’m at My Best – Nobody Can Beat Me! 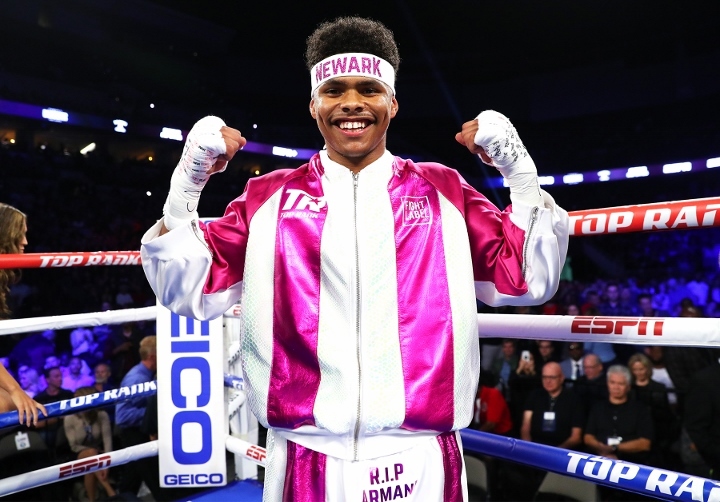 Shakur Stevenson, the 21-year-old wunderkind who captured a silver medal for the United States at the 2016 Rio Olympics, will begin his 2019 campaign with his toughest professional bout to date. Stevenson (9-0, 5 KOs) will battle Jessie Cris Rosales in a 10-rounder for the IBF Intercontinental and WBC Continental Americas featherweight belts on Friday, Jan. 18 at Turning Stone Resort Casino in Verona, N.Y.
Stevenson-Rosales will serve as the co-feature to the Bryant Jennings-Oscar Rivas heavyweight main event, both of which will stream live beginning at 9:30 p.m. on ESPN+ — the new multi-sport, direct-to-consumer subscription streaming service from The Walt Disney Company’s Direct-to-Consumer & International segment in conjunction with ESPN. The undercard, including the highly anticipated pro debut of former Indian amateur standout Vikas “The Indian Tank” Krishan, will also stream live on ESPN+ beginning at 6:30 p.m. ET. Promoted by Top Rank, in association with Groupe Yvon Michel (GYM), tickets, priced at $79, $62, and $45, are available at the Turning Stone Resort Box Office by calling 315-361-7469 or online at Ticketmaster (www.ticketmaster.com). Rosales (22-1-1, 10 KOs), a 27-year-old native of Cebu City, Cebu, Philippines, will be making his U.S. debut against Stevenson. He is coming of a second-round KO victory in March against Ibrahim Balla (13-1 at the time) in Altona North, Victoria, Australia. The only blemish on his record came via second-round KO in 2017 to former two-division world champion Jhonny Gonzalez. Krishan, the most highly decorated amateur in the history of Indian boxing, will take on Steven Andrade (3-3, 2 KOs) in a six-round super welterweight bout. A 26-year-old southpaw, Krishan represented his homeland at the 2012 and 2016 Olympics and became the only Indian fighter in history to capture gold medals at both the Asian and Commonwealth Games. He made headlines at the 2012 Olympics for defeating Errol Spence Jr., only for the Amateur International Boxing Association (AIBA) to overturn the result a few hours later because of fouls that Krishan committed during the match. Super welterweight contender Carlos “Caballo Bronco” Adames (15-0, 12 KOs) will take on the veteran Juan Ruiz (21-3, 13 KOs) in a fight scheduled for 10 or eight rounds. Adames is coming off a second-round destruction against Joshua Conley on the Terence Crawford-Jose Benavidez Jr. undercard Oct. 13 in Omaha, Neb. Robson Conceicao (10-0, 5 KOs), a Brazilian who won a gold medal in front of his home fans at the 2016 Rio Olympics, will continue his march toward a 130-pound title shot in an eight-rounder versus Hector Ambriz (12-8-2, 6 KOs). Former super featherweight world champion Jason Sosa (21-3-4, 15 KOs) will face the rugged Moises Delgadillo (17-18-2, 9 KOs) in a super featherweight bout scheduled for 10 or eight rounds. Fazliddin Gaibnazarov (6-0, 3 KOs), who captured Olympic gold for his native Uzbekistan in 2016, will fight Ricardo Garcia (14-4-1, 9 KOs) in an eight-round super lightweight bout. Garcia has never been knocked out as a pro. Heavyweight prospect Cassius Chaney (14-0, 8 KOs) will look to extend his KO streak to four against Michael Glasscox (6-2-2, 5 KOs) in a six-rounder. Share the joy Hey, yo. It’s time to start up a Tweets of the Week post for some Sunday silliness.